Vintage, Anchor Hocking Crystal, Depression Glass in the Oyster and Pearl-Clear Pattern, Dinnerware Set, Made from 1938 to 1940, Totaling (46) Pieces. 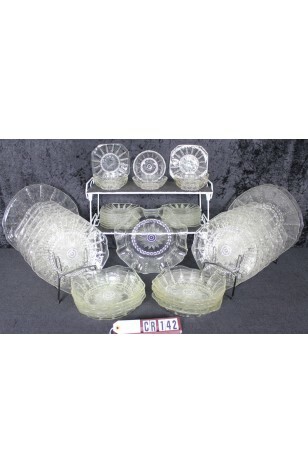 A Rare and Beautiful Anchor Hocking Crystal, Vintage Depression Glass Dinnerware Set. The Oyster and Pearl Clear Pattern is just gorgeous. Sadly, pictures simply can't showed it, as it truly is. Produced from 1938 to 1940 in a Pattern that simply is rarely found today. The Oyster Shell Shapes, and the Crystal Pearls, make up this pattern. In great condition. A Rare and Beautiful Anchor Hocking Crystal, Vintage Depression Glass Dinnerware Set. The Oyster and Pearl Clear Pattern is just gorgeous. Sadly, pictures simply can't showed it, as it truly is. Produced from 1938 to 1940 in a Pattern that simply is rarely found today. The Oyster Shell Shapes, and the Crystal Pearls, make up this pattern. In Very Good Resale Condition unless noted below or seen in pictures. 16 - Dessert/Bread/Butter Plates - 6"
8 - Salad Plates - 8 1/8"
12 - Luncheon Plates - 9"
3 - Dinner Plates - 11"
6 - Fruit/Sauce Bowls - 5"